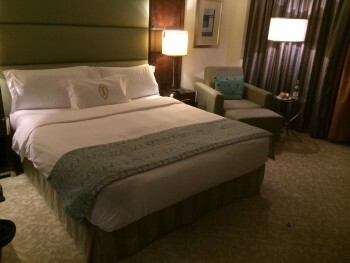 My review of the InterContinental Abu Dhabi hotel – it is good news and bad news! This is my review of the InterContinental Abu Dhabi hotel. Last time I was in Abu Dhabi I had a very pleasant time at Jumeirah at Etihad Towers which I reviewed here. This was going to be a little different. I was unlikely to get to the hotel before 2am and I needed to be back at the airport for around 5pm. A guarantee late check-out was therefore top of my list and this is a benefit of the InterContinental Ambassador programme which I discuss here. I could also have got a guaranteed 4pm check-out by using American Express Fine Hotels & Resorts (an Amex Platinum benefit) to book at one of their participating properties. However, since I also wanted to trigger my 80,000 bonus points from IHG’s Accelerate promotion, the InterContinental Abu Dhabi (click here for the hotel home page) seemed the best choice. Etihad gave me a free chauffeur drive as part of my redemption so that was quickly sorted. Check-in was enthusiastic, I couldn’t fault that. We then got to my ‘guaranteed’ Ambassador upgrade. I had been upgraded to a room on the Club Lounge Floor. Except, erm, I wasn’t allowed to use the lounge. So, erm, what benefits exactly did I get from this? Tricky one. To be honest, it wasn’t clear. Perhaps you don’t get a bathrobe in the standard rooms – that is often the only difference between an executive room and a standard one, bar the lounge access! In practical terms, it made no difference. It was 2am and I wasn’t going to be around much. Here are a couple of shots of my room. It was perfectly acceptable although it had not been refurbished for a while. Next morning, however, I DID get annoyed when I headed down to breakfast. In what is theoretically a major business hotel, you expect certain things. You expect, for example, to head downstairs and be met with a relatively calm dining room where you can eat, perhaps catch up with a newspaper and – if on business – prepare yourself for the meetings or negotiations ahead. What I didn’t expect was to find 200 package tourists in the breakfast room, taking every available seat and creating substantial backlogs for food. It seems, with Abu Dhabi suffering from an over-supply of high end rooms, that the InterCon has plunged downmarket. I should have seen this coming, to be honest, since a week earlier I had actually spoken to someone who had just returned from a holiday in Abu Dhabi – staying at the InterCon! The hotel appears to be dumping its rooms in the package holiday market. What this meant, in reality, is that I was one of only a handful of people in the hotel paying the advertised rate! And I still got a rubbish upgrade. I was even more annoyed that they had refused me Club access, since that would have been an easy way to keeping genuine business travellers away from the package tour hoards. After breakfast, with a couple of hours to spare after catching up with HFP developments, I walked over to the beach. This was quite impressive. You need to take a 3-4 minute stroll along the marina to get to the hotel beach club. Once there – and access is free to guests – you will find a couple of family-friendly pools, two restaurants, a gym and a beach with more than enough sun loungers. The effect is spoiled by the view from the beach – it is not open sea as there is a man-made spit of land about 200 feet ahead of you which looks like it will soon be developed – but for a city hotel it is not bad. For a family, it is a better option than Jumeirah – although that is a classier option overall, and their beach is directly outside the hotel. I should also mention that the InterCon has an additional outdoor pool in the main hotel if you don’t want to walk to the beach club. I was in the beach club for a couple of hours, which included a painfully slow restaurant lunch despite a very small number of customers. At 4pm I checked out and headed back to Abu Dhabi airport for my Qatar Airways First Class flight to Doha. Can I recommend the InterContinental Abu Dhabi? Not really. If you want a business hotel, you will be substantially happier at the Jumeirah. If you want a resort for a family holiday, there are resort hotels on Yas or Saadiyat Island that will serve you better. 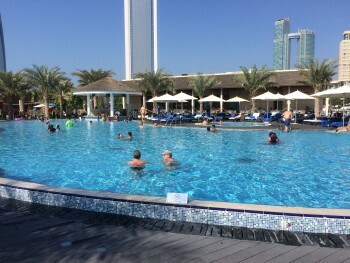 It might work for you if you are on business but you know you will have a lot of down time, as the beach club has more options than the Jumeirah beach and pool area. Apart from that, though, I see no real reason to return. 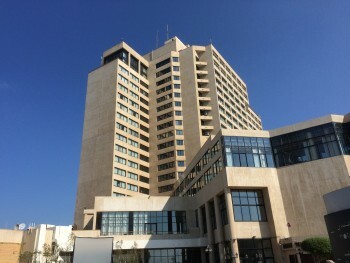 You can find out more about the hotel, and book, on this page of the InterContinental website. 3) my complaint / comment is that business travellers expect certain levels of service and facilities, all of which are meant to make their trip more productive and / or smoother. This sort of breakfast service is not condusive to that sort of environment. At the end of the day, you pay a premium for the IC compared to many other hotels and that is the reason why. There are a few hotels that advertise a beach (Fairmont, Shangri-La, Ritz-Carlton) that open onto an inland water way as opposed to open sea. This may affect the enjoyment of some guests. Kempinski Emirates Palace has an amazing beach, close to the Corniche but comes with a hefty price tag. The St Regis and Park Hyatt (both on Saadiyat Island) are by far firm favourites of mine for a beach chill & flop in pleasant surroundings and are more realistically priced in my opinion. The lack of lounge access despite Ambassador Spire upgrade was the only negative at IC Hong Kong (not the Stamford). It was a (costly) option. It would be nice to think that lounge access in IC on upgrade might be one of the additional benefits of Spire that are supposed to be coming in 2016. I won’t hold my breath…..
You had to open a door all by yourself!? Good heavens. Sorry, I know that’s probably a legitimate complaint for the sort of people who stay in these properties but I just can’t take that seriously! If you’d turned up with your family, a buggy and 4 suitcases, you wouldn’t be laughing. I agree with you Rob. It isn’t whether one is capable of opening a door oneself – I presume you are otherwise life would be quite difficult ! 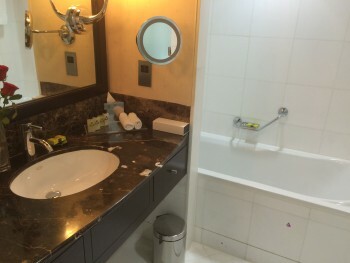 – but more that there are a certain set of amenities expected at a 5 star hotel. A professional, respectful greeting at the front door is one of those for you – and it is for me too. I see both sides here rob, i agree with ‘door gate’ it’s not that you refuse to open your own door you just expect a decent 5 star hotel to have this as a basic welcome. I get what your saying but can I just ask as a complete novice why book the IC? I wouldn’t ever consider it a decent business hotel chain, I always find them over priced 80’s chince that sometimes push themselves into the 90’s if you’re lucky. I always associate IC with those big throws on the beds etc. I would certainly never pay a premium for it in fact I avoid at all costs! 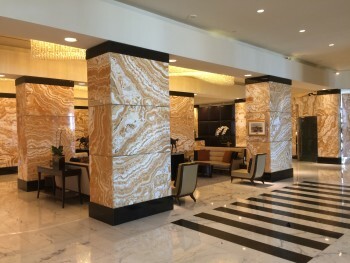 I would say there are other decent business class hotels that you could have found more suitable I would suggest Sofitel corniche for starters. My Accelerate target is worth £400 of free stays so it was foolish not to tick off a box for that. I needed a 4pm late check-out (which the Sofitel would not have given me) in order to avoid getting stuck – Ambassador guarantees that. I would say that IC is generally regarded as the best of the major chains behind Park Hyatt in terms of hotel quality. It has some exceptionally good hotels (Paris, Hong Kong, Sydney, Amsterdam) and some very good ones. Obviously a few stinkers as well but you can’t have it all! Paris, HK, Sydney and London have all had £50m – £100m spent on refurbishments in the last 5 years or so. New York (The Barclay) re-opens in May after a total gutting and the other NYC hotel is very new. Looks at my pics of the IC Bordeaux which has just opened to see what they can do. Also worth noting that Dublin used to be a Four Seasons until last year and was furnished by FS. Totally see why you stayed here, Rob – must say I’ve not been massively impressed with the ICs I’ve stayed at so far (Wellington & SFO) – Conrad (esp Singapore) and WA Rome have been more impressive. I read this article having just checked out of the Sheraton Furteventura. An acceptable hotel on the surface but dominated by the package tourist. Upon trying to check out at the SPG plat counter, I was directed to the back of the main queue at the non SPG counter and instructed to wait my turn! In the meantime my wife and child were in the room still waiting for someone to come and collect the bags. After 20 minutes of being told someone is on the way, she had to carry them herself along with a small child. Again, in a similar vein to Raffles at IC Abu Dhabi, queuing up is not beyond me nor is carrying my own bags but you expect certain things as an elite member and it ended the stay on a sour note. I’m not even sure whether it is worth complaining as the management clearly don’t care for loyalty members. Or maybe I should contact SPG directly? Do. Corporate will compensate you. Thanks, I’ll give it a go!